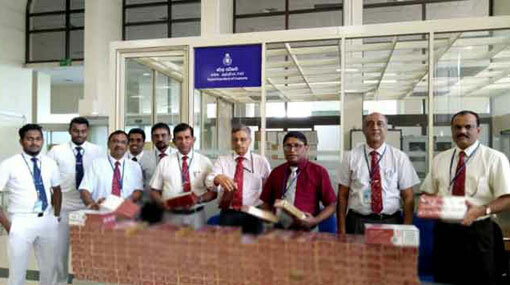 Two passengers have been detained at the Bandaranaike International Airport for smuggling in a stock of foreign-manufactured cigarettes into the country. The two detainees, who had arrived from Dubai at around 5.00 a.m. this morning (21), were apprehended by the Customs officials attached to the BIA. Reportedly, the Customs officials have seized 53,460 sticks of foreign cigarettes valued at Rs 2.94 million hidden inside the travelling bags of the two detainees. One detainee is revealed to be an 18-year-old residing in Aluthkade area while the other detainee is a 40-year-old from Maligawatta area. Customs officials are conducting further investigations into the incident.